Native to the cordilleran region of Alaska, western Canada, western United States, and northern Mexico. Widely naturalized. Dry. Roadsides, sidewalks, and waste places. Full sun. This is a low, erect annual that rises on multiple stems from a branching taproot. The flowers and leaves, when crushed, smell of pineapple, giving this plant its common name. The stems are erect or ascending, hairless, frequently-branched, and 1″ to 18″, but usually 8″ to 12″ tall. The leaves are alternate, hairless, fern-like, ½″ to 2″ long, and up to ¾ inch wide. They are deeply cut into lobes that are spaced out along the midrib but not cut to the midrib; the lobes do not form separate leaflets (pinnatifid). The lobes may themselves be divided into lobes (bipinnatifid), which may be again divided into lobes (tripinnatifid). The inflorescence is numerous flowers both in clusters and in leaf axils. A branched, elongated flower cluster forms at the end of some of the stem branches. Within each cluster the lower flower stalks are longer than the upper. Single flowers rise from upper leaf axils on ½″ to 1½″ long flower stalks. The composite flower head is a ⅜″ wide disk of yellow or greenish-yellow flowers in an egg-shaped dome with no ray flowers. The latin name of this species, discoidea, means without rays. There are two rows of green, overlapping, semi-translucent bracts surrounding the flower head. At the base of the flower head the part of the stem on which the disk flowers are borne (the receptacle) is smooth, not bristly or chaffy. The fruit is dry and seed-like, with no fluffy awns or bristles at the tip. 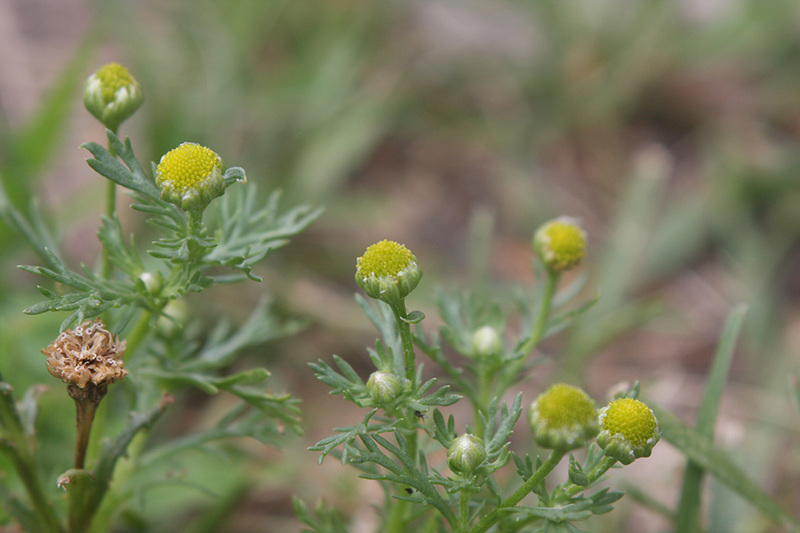 Common tansy (Tanacetum vulgare) has a flat, wide, tightly-packed cluster of flower heads. 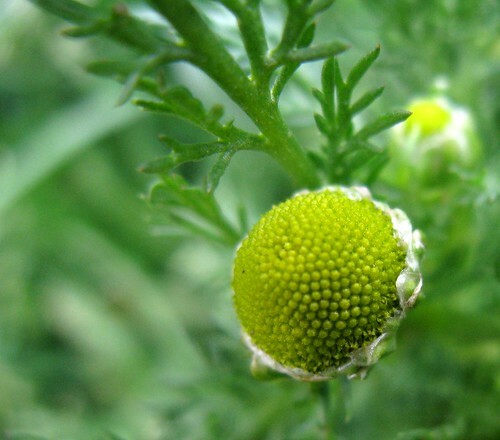 Each flower head of common tansy is flat and topped with a brush of fine hair. The flower head of pineapple-weed is dome-shaped and smooth. Sources: 2, 3, 4, 5, 7, 22. Twice pinnatifid. Cut deeply into lobes with each lobe also cut into deep lobes. The part of a flower stalk on which the flower head is borne. In composite flowers, the part on which the flowers are borne. 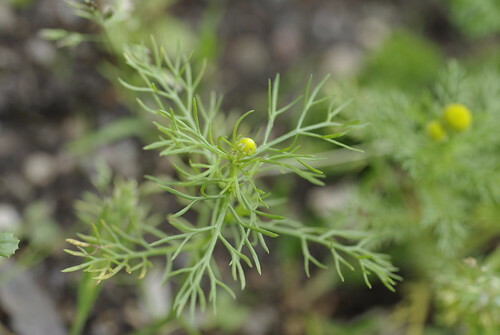 http://www.learningherbs.com/ Pineapple weed is an excellent herb for stress. It is also a pink eye remedy, stuffy nose remedy, stomach ache remedy, colic remedy, flatulence remedy, as well as itchy skin remedy. 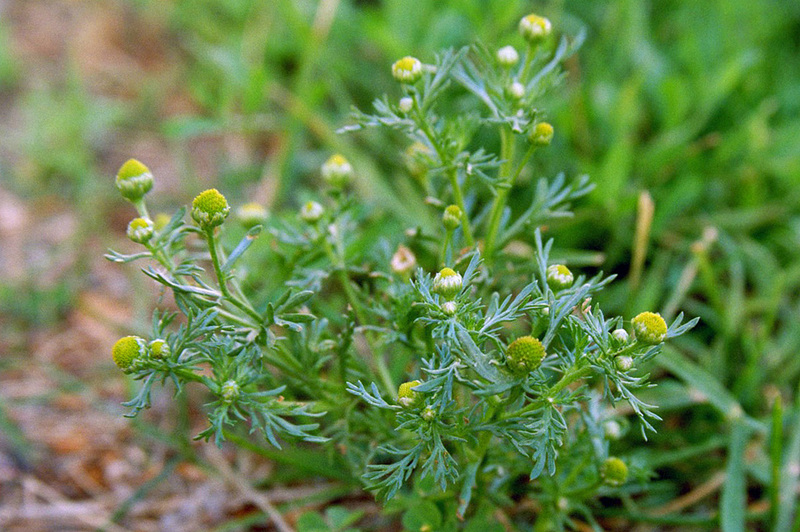 Along with wild chamomile, pineapple weed is one of the herbs for stress. 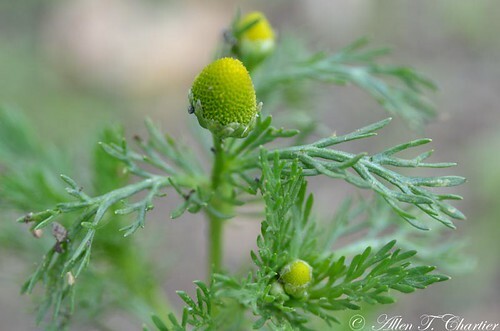 Pineapple Weed - A member of the Asteraceae Family. Low-growing in compacted soils. When the flowers are crushed the aroma of pineapple is evident.